“MiLB High A/Double A” is overstating it a bit. Their all-stars (i.e. the best players from the entire league) only went 6-10 against the Can-Am League, with a grand total of 0 home runs in those 16 games. That is what I had a player, who played here professionally and is currently playing there, tell me. It’s a bit different over there than here, so being unfamiliar with strike zone etc. could factor in. The player can tell you whatever he wants, but the numbers don’t bear that out – and I’d say 16 games is a decent sample size (and plenty of time to become familiar with any differences in the strike zone). – Shikoku scored 3.1 runs per game – every other Can-Am team was at 3.9 or above. – Shikoku had a team ERA of 4.82 – every other Can-Am team was at 4.38 or below. (I’m excluding road-only Garden State here, as they played a limited schedule and did not have the same player salary budget as the other clubs). Okay. I understand what you’re saying. I’m just saying what I was told. I’m not in Japan watching them, and I didn’t have a chance to see them play the Can-Am teams. Thanks for the insight! I changed it to Low A/High A or Frontier level of playing.. so that’s a bit closer. Would anybody know when these tryouts will be coming back to California in 2016? 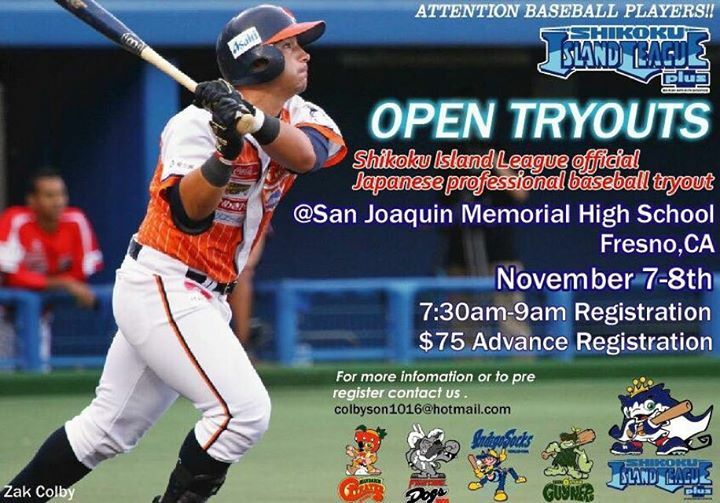 I’m a left handed pitcher based out of San Diego,CA that is looking to play pro ball in Japan. 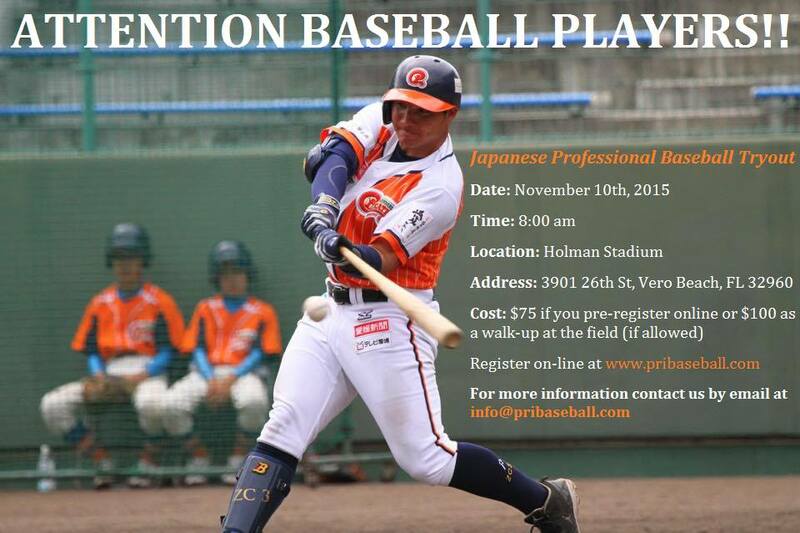 I heard this Japanese independent league is a good place to play and for players to keep their skills up. It probably won’t be until the end of the season at least. They just started their season in Japan as well, and as far as I know, they only recruit over here once a year. I’ll definitely post once information becomes available! Ok thanks. Would you happen to know any independent ball tryouts in that are coming up around may besides the ones posted on this website? The closest once to me is in San Rafael,CA in April. Everything posted is everything I know! Ok thanks! Quality site by the way! Thank you!! Be on the lookout for a feature about the Japanese Indy League… I personally know two guys who got signed from the tryouts and are over there now playing spring training games! Cool! What team do they play for in the Japanese Indy league? I’m very familiar with the NPB in Japan. I hear its pretty competitive . Also, would you know what are some things these Japanese scouts are looking for in a left handed pitcher? They play for the Kōchi Fighting Dogs. It’s in the league under the NPB. I’m honestly not sure exactly what they were looking for… Shoot me an email kaymthompson52@gmail.com so I have yours. I’ll be able to send you info that way. I just sent you a message via email. This happened in November. No word on the next one here for this year, but they are in the middle of their season right now. I’m sure it won’t be until after that. Probably October or November again. I’m asking the same thing. I’m really up and wanting to play pro ball in Japan. I don’t have that info right now. Sorry guys. They aren’t actively looking for players at the moment as far as I’ve been told. Any more updates on the Japanese Independent Ball league? Hasn’t been one made in a while. – Thank you. Not sure what kind of updates you are looking for… But in all honesty, once the Americas go over there (the very few who do) they don’t seem to play much and it’s near impossible to get news about them. I’ve even asked multiple times for updates from the person who ran these tryouts and was ignored or told it would get done, but never was. Super hard to get into Japan to play ball as an import. They have roster rules that limit the amount if foreign players, and Japan is one of the harder countries to get into. Without any pro experience, it’s nearly impossible. I’d look at the other indy leagues here first. If you can’t catch on with a team here, somewhere in Europe would probably be your last chance.